Faculty of Law Celebrates Student Excellence — UTech, Ja. High Achievers: Hon. Zaila McCalla, OJ, (centre) Chief Justice of Jamaica shares in congratulating outstanding Faculty of Law, Student of the Year awardees, Miss Ann-Marie Moore - Papine Campus and Mr. Jason Chockela - Western Campus following the Faculty’s annual Awards Ceremony held on April 7, 2016 at the Terra Nova All Suite Hotel in Kingston. Miss Ann-Marie Moore also copped the award for outstanding performance in the course of study, Equitable Remedies, Year 3. Mr. Chockela copped the top prizes for his Year 2 performance in Administrative Law, Equity and Trusts, Real Property 1, Public International Law, Private International Law and Intellectual Property Law, Year 3. The high achiever was also named to the Dean’s List and was presented with a Certificate of Appreciation for community service and for his participation in the Caribbean Court of Justice Moot Court. Prof. Colin Gyles, Acting President in congratulating the student awardees expressed pride that UTech, Jamaica has had the distinction of producing graduates who have gone on to do very well at the Norman Manley Law School in their course of study towards obtaining a practicing certificate. The Acting President recognized the sterling contribution of pioneers of the Faculty of Law, Prof. Kent Pantry, CD, QC and Prof. the Hon. Oswald Harding, OJ, CD, QC who he lauded for their “ground breaking work and influence that will continue to redound to the benefit of the Faculty.” University Registrar, Dr. Elaine Wallace in her greeting, also lauded the achievements of students, graduates and founding Deans, Prof. Kent Pantry and Prof. the Hon. Oswald Harding, OJ. A special feature of the 2016 Awards Ceremony was the recognition of Prof. Kent S. Pantry, CD, QC and Prof. the Hon. Oswald G. Harding, OJ, CD, QC, PhD - the two most formidable pioneers who have laid the foundation for the establishment, growth and development of the Faculty of Law since its inception in 2009 - Members of their respective families, members of the judiciary, faculty, staff and students were on hand to share in an outpouring of honour and appreciation presented to the exemplars through citations and other special awards. Pointing out that the objective has always been to complement rather than to compete with legal education offerings at the University of the West Indies (UWI), Mr. McPherson said that notwithstanding the initial challenging stages, the Faculty of Law has continued to grow from strength, to strength, building on the gains laid by Prof. Pantry, Prof. Harding and the team of faculty and staff. Mr. McPherson noted with pride that students of the Faculty “have proven that they are some of the best trained at the undergraduate level,” adding that those who have advanced to the Norman Manley Law School have distinguished themselves, with as many as 9 UTech, Jamaica trained, out of 21 persons making the Dean’s honour role in one year. Mr. McPherson used the occasion to assure students that his lobby efforts continue with the objective of ensuring that the playing field will be levelled soon, with respect to parity in the entry of UTech, Jamaica graduates into the Norman Manley Law School. Mr. Pantry in his humbled response following the presentations, said that he is happy to have been a part of the establishment of the Faculty of Law, noting with pride that the task was accomplished in the relatively short time of only seven months. He specially recognized administrators Mrs. Elaine Codner and Mrs. Karen Rhule, Executive Assistant and Faculty Administrator respectively who he saluted for their outstanding contribution to the growth and development of the Faculty from inception, and who he noted, often went beyond the call of duty during the early days of ‘teething pains.” The sentiments were echoed by Prof. Harding who succeeded Mr. Pantry as Dean of the Faculty in 2011. He expressed pride in the many achievements of the graduates and students of the Faculty of Law and the significant growth and development of the Faculty since its establishment. Former Deans Honoured: A beaming Prof. Kent Pantry, CD, QC (above, left) accepts his citation from Mr. William Potopsingh, Lecturer, Faculty of Law and below, Prof. the Hon. 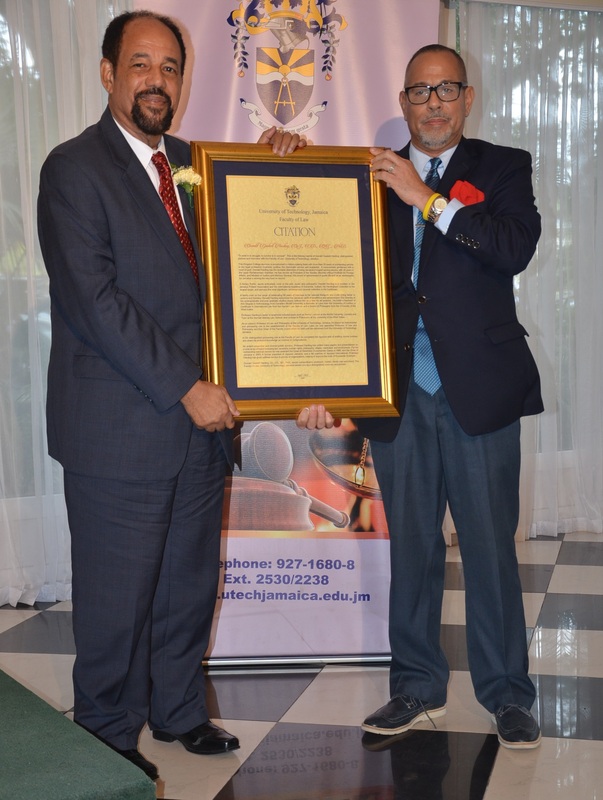 Oswald Harding, OJ, CD, QC (left) happily displays his citation presented by Mr. Alfred McPherson, Dean, Faculty of Law, UTech, Jamaica. Guest speaker at the ceremony, Chief Justice Zaila McCalla joined in congratulating the student awardees and the two special honorees, who she recognized as “outstanding members of the legal profession who have given back to a very grateful nation.” Commenting on the theme of the ceremony, the Chief Justice lamented that despite the appearance that we live in a world where the notion of what is sound integrity, outstanding service and professionalism are constantly being debated and redefined, she encouraged the budding attorneys to remain “professional, take pride in doing a job well done and paying close attention to details,” as they seek to hone their skills. Emphasising the potential impact of the conduct of an attorney on people’s lives and their livelihood, the Chief Justice stressed the importance of building a good character by taking appropriate steps to prevent and to correct mistakes and displaying good probity, integrity and fairness in the execution of duties. Seven (7) students were specially recognized for meeting the criteria for the distinction of being named to the Dean’s List for attaining a GPA of 3.45 or above and having passed all modules on the first attempt. Certificates of Appreciation were presented to thirteen (13) students for their various contributions to the growth, development and service to the Faculty. The ceremony was interspersed with entertainment courtesy of the musical talent of the Faculty of Law student and staff combined choir.